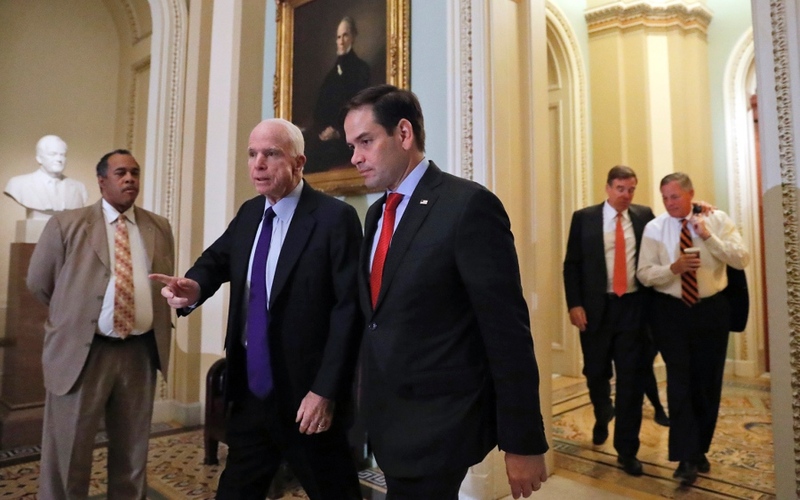 WASHINGTON, D.C. (AP) — Sen. John McCain, who faced down his captors in a Vietnam prisoner of war camp with jut-jawed defiance and later turned his rebellious streak into a 35-year political career that took him to Congress and the Republican presidential nomination, died Saturday after battling brain cancer for more than a year. He was 81. Written by NANCY BENAC, Associated Press. It’s a crying shame that this man won’t get his proper due from President Bitterpants. 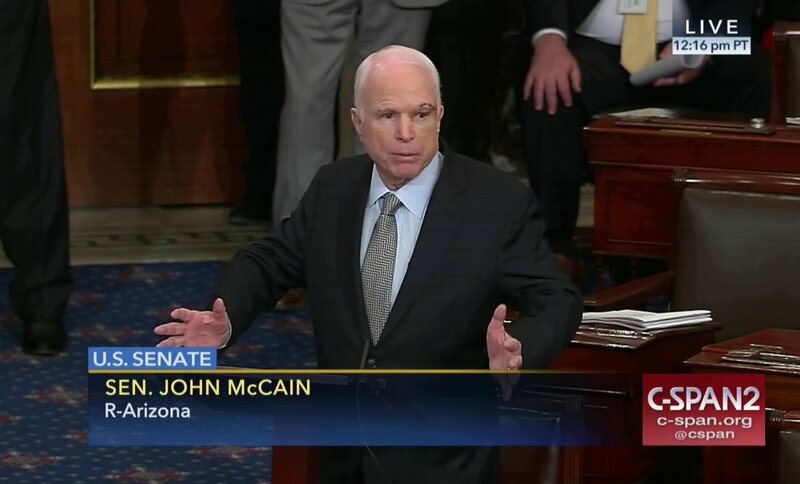 I wasn’t a fan of McCain, per se. BUT, he had my immense respect for what he endured as a POW. Regardless of political affiliation, America lost one of the brave ones today. RIP Senator. McCain was a hypocrite who had begged for Trump’s endorsement in a prior race. Good riddance! John McCain will NOT be missed! Got what he deserved for hating on Trump! Anyone who does not hate the piece of excrement in the White House is stupid. McCain served our country in war time while the coward Trump chickened out on his obligation. Trump has done far more good for our country than McCain ever has. The only reason people are upset is because Trump is doing exactly what he said he was going to do. 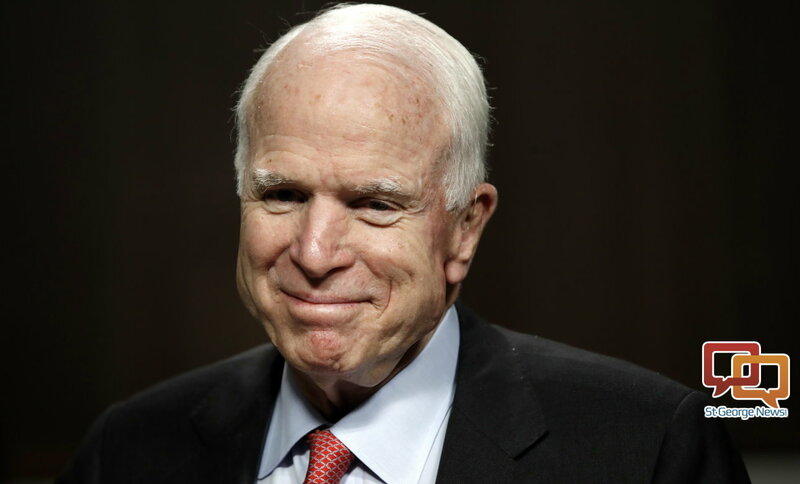 McCain leaving us was just part of the process of draining the swamp, and that process will continue! If you think the “swamp” is being drained, you clearly are not paying attention. Shallow thinkers like you are the perfect Dump voters. You sound like a brainwashed zombie. McCain was a war hero. Cadet Bonespurs is a draft-dodging coward. Facts must hurt folks like you. Painful, isn’t it? Your president makes the rest of us sick to our stomachs. Not much longer, though. Redbud is right and you are the brainwashed sheeple! You libbies just don’t get it. It’s all over your heads and it’s hilarious! I don’t think it was so much the brain tumor… but the Terminal TDS. A man of real integrity, unlike the pos potus president that was too cowardly to go to war. Unlike so many of the fake self proclaimed patriots of Southern Utah, John McCain will be missed. Fake McCain will NOT be missed! Songbird McCain was not a man of integrity. May God have mercy on his soul! I admit the news of your passing made me frown a little bit. Though I did not agree with many of your political stances -I don’t ALWAYS agree with everyone- I truly believe that you worked for the betterment of all Americans. I almost voted for you in 2012 and probably would have in 2016. There are few politicians (and even fewer Republicans) that truly care about and work for the American people. You were one of them. Rest in Peace, Good sir. May God have mercy on his soul! He served with the spirit of hatred and everyone is now dumber for having listened to him! Flags at half-staff for a dead televangelist for a few days. Flags at half-staff for a sitting senator for a few minutes. Whatever your opinions on all involved you have to see something wrong with that?